Green River is a city in Emery County, Utah, United States. The population was 952 at the 2010 census. The city is located on the banks of the Green River, a major tributary of the Colorado River. The San Rafael Swell region is to the west of the city, while Canyonlands National Park lies to the south. Today located exclusively in Emery County, the city was split between Emery and Grand counties until January 6, 2003, when Emery County's boundaries were expanded to follow the city limits. According to the United States Census Bureau, the city of Green River has a total area of 12.6 square miles (32.6 km2), of which 12.5 square miles (32.3 km2) is land and 0.1 square miles (0.3 km2), or 0.87%, is water. Interstate 70 passes just south of the city, with access from Exits 160 and 164. The highway leads east 102 miles (164 km) to Grand Junction, Colorado, and west 162 miles (261 km) to its western terminus at Cove Fort. Just west of Green River, US Routes 6 and 191 lead northwest 64 miles (103 km) to Price. Crystal Geyser, a cold water "geyser"---actually a carbon-dioxide driven, erupting well---is located about nine miles southeast of town (Glennon, J.A. and Pfaff R.M. 2005). According to the Köppen Climate Classification system, Green River has a semi-arid climate, abbreviated "BSk" on climate maps. The 1829 to 1850s Old Spanish Trail trade route passed across the Green River in the area of modern Green River from 1829 into the 1850s. John Wesley Powell embarked on the first of two voyages down the Green River in May 1869 and floated the river all the way to its confluence with the Colorado and beyond. Powell left a detailed account of the river and the surrounding landscape and prepared the first thorough maps of the river basin. Powell left his mark on the in other ways as well. He and his men named most of the canyons, geographic features, and rapids along the Green River during his two voyages in 1869 and 1871. Powell also paved the way for later generations of explorers and scientists interested in the unique geology of the basin of the Green River. The settlement of Green River started as a river crossing for the U.S. mail. In 1876, a Mr. Blake set up a ferry and way station on the east side of the river. It became a stopover for travelers with a ferry for transporting people, supplies, and animals across the river. In 1883 the line commonly known as the Utah Division of the Denver and Rio Grande Western Railroad was built and a train station was opened. The west side of the river became known as "Greenriver" (later changed to "Green River"), and the east side of the river became known as "Elgin", and is still referred to by that name today. With the coming of the railroad, the town quickly went from a small farm hamlet to a boom town with workers coming to build the bridge and the road bed for the railroad. After completion of the railroad, Green River became a fueling, watering stop for the railroad, with switching yards and engine sheds. A hotel called the Palmer House was built and became the scheduled meal stop for trains from both directions for many years. Green River enjoyed the railroad boom until 1892, when the railroad transferred most of its operations to Helper. The population of the town declined significantly. Throughout the 1940s, 1950s, and 1960s the mining of uranium played a significant role in the economy of Green River. Several trucking companies hauled ore from mines in the Four-Corners Mining District west of Green River, the San Rafael Swell, the Henry Mountains, and the area that is now Lake Powell. The U.S. Air Force built the Green River Launch Complex just outside Green River in 1964. It was an annex of the U.S. Army's White Sands Missile Range. From 1964 to 1973 the Air Force launched 141 Athena missiles from the Green River complex, near the Crystal Geyser, as part of research to improve nuclear missiles. Amtrak, the national passenger rail system, provides service to Green River station, operating its California Zephyr daily in both directions between Chicago and Emeryville, California. Interstate 70, along with U.S. 6, U.S. 191, and U.S. 50, also passes through Green River, the first Eastbound services after Salina and the final Westbound services, due to the fact that the two cities are 110 miles apart, the longest stretch with no services in the United States. The Main road in Green River is a short State road, SR 19, with Business I-70. As of the census of 2000, there were 973 people, 329 households, and 238 families residing in the city. The population density was 77.8 people per square mile (30.0/km²). There were 376 housing units at an average density of 30.0 per square mile (11.6/km²). The racial makeup of the city was 88.28% White, 0.92% African American, 1.23% Native American, 1.23% Asian, 0.41% Pacific Islander, 7.09% from other races, and 0.82% from two or more races. Hispanic or Latino of any race were 19.63% of the population. There were 329 households out of which 41.9% had children under the age of 18 living with them, 56.2% were married couples living together, 12.8% had a female householder with no husband present, and 27.4% were non-families. 24.0% of all households were made up of individuals and 11.9% had someone living alone who was 65 years of age or older. The average household size was 2.96 and the average family size was 3.48. In the city, the population was spread out with 35.7% under the age of 18, 9.8% from 18 to 24, 26.2% from 25 to 44, 17.2% from 45 to 64, and 11.2% who were 65 years of age or older. The median age was 29 years. For every 100 females, there were 93.8 males. For every 100 females age 18 and over, there were 93.2 males. The median income for a household in the city was $28,000, and the median income for a family was $31,667. Males had a median income of $28,417 versus $16,477 for females. The per capita income for the city was $11,326. About 12.5% of families and 15.6% of the population were below the poverty line, including 19.8% of those under age 18 and 11.9% of those age 65 or over. Located approximately 100 miles (160 km) in either direction from Richfield, Utah, and Grand Junction, Colorado, Green River's local economy primarily caters to serving passers-by on Interstate 70, since there are no services on I-70 westbound between Green River and Salina, 107 miles (172 km) away. The economy relies heavily on hotels, fast food and a few other restaurants and gas stations. A large natural gas field has been discovered 3 miles (5 km) south of the city. The field is operated by Delta Petroleum headquartered in Denver, Colorado. Green River is famous for its melons, sold during the growing season. It is also a popular freeride mountain biking spot. It can be seen in films such as New World Disorder 7. Green River is the setting for the Bud Shumway mystery series by Chinle Miller, the first being The Ghost Rock Café, named for a landmark on the San Rafael Swell. A proposed nuclear power plant, the Blue Castle Project, is located about five miles west-northwest of the town. Emery Telecom is the local telephone and high speed internet provider, while Satview Broadband Ltd is the local cable television company. The town becomes the new home of the Mousekewitz-family in An American Tail: Fievel Goes West as well as the main location in the subsequent television series Fievel's American Tails. The town was featured in the film "The Wizard" with Corey Woods sneaking his brother, Jimmy out of a mental institution to California for a Nintendo tournament. Green River has been home to world renowned authors Pearl Baker (‘Robber’s Roost Recollections’) and Rebecca Davis (‘Blind Owl Blues’). ^ a b "Geographic Identifiers: 2010 Census Summary File 1 (G001): Green River city, Utah". American Factfinder. U.S. Census Bureau. Retrieved March 30, 2016. ^ Geographic Change Notes: Utah Archived 2008-05-02 at the Wayback Machine, United States Census Bureau, 2007. Accessed 2009-03-04. ^ "History of Green River". Official Website for Green River, Utah. City of Green River, Utah. Archived from the original on October 8, 2009. Retrieved 11 December 2009. ^ Stoddard, Patsy (January 24, 2017). "Update on the Nuclear Power Plant for Green River". Castle Dale, Utah: Emery County Progress. Archived from the original on February 9, 2017. Retrieved February 9, 2017. ^ "Dallyn Bayles - Mormonism, The Mormon Church, Beliefs, & Religion - MormonWiki". www.mormonwiki.com. Retrieved 2019-03-08. ^ "Dallyn Vail Bayles | Official Website". www.dallynvailbayles.com. Retrieved 2019-03-08. Glennon, J.A., Pfaff, R.M. (2005). "The operation and geography of carbon-dioxide-driven, cold-water geysers," GOSA Transactions, vol. 9, pp. 184–192. 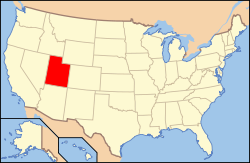 Wikimedia Commons has media related to Green River, Utah. This page was last edited on 6 April 2019, at 03:18 (UTC).